It feels as though it’s been sooooo long since I’ve written–my apologies! It’s been a busy few weeks, that’s for sure. What fun I had on my trip to see my good friends in Pennsylvania and in doing my cousin’s wedding in DC. I survived my own wedding anniversary, and summer has officially arrived. There have been all kinds of activities and projects brewing at Satis House, so I’ll try to write more throughout this week to catch you up on the goings on. What I really would like to offer tonight is a piece about the altar that I finally set up in my new house. I may have mentioned this concept before, but as I didn’t see it in my “Shabbat Shalom” post, I’m thinking maybe I haven’t shared it, so here it is: “religious envy.” Allow me to explain. The rabbi who co-led the trip I took to Israel/Palestine in 2010 shared this idea with us, and I love it. Religious envy is basically the feeling one has in wishing that one’s own religious tradition employed certain beliefs or practices evident in another’s tradition. The example he gave, as a Reform Jew, was that he had religious envy of muslims because of the way their full bodies are incorporated in their daily prayers. He wished that his own tradition had open space set up for people to lie prostrate and move and bow in prayer during corporate worship. So at some point I identified that I felt religious envy toward buddhist and hindu people who commonly place an altar within their living space. You may have noticed them at nail salons or Thai restaurants as well–often a simple platform with a statue of the buddha, some flowers, and maybe some fruit or rice placed there as the day’s offering. I never had made an altar in my own house until last summer. I started attending my meditation group when I was grappling with my varying levels of personal crises. They have an altar in the zendo (like the equivalent of the “sanctuary” for buddhists and where the sangha meets to meditate). 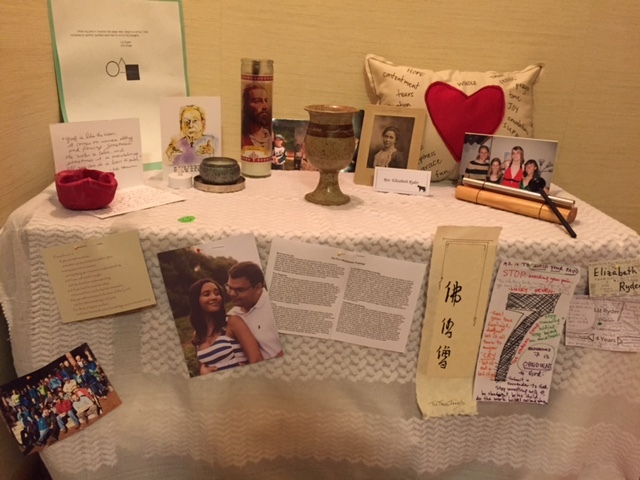 Their altar is simple and includes a picture of their teacher–Thich Nhat Hanh–and usually some candles and flowers. My altar space last summer became so special to me. Every morning I would get up at 5 a.m. to kneel and meditate and pray and cry and think and wonder what the hell was happening and what was going to come of it all. I set pictures on my altar of people I love, and I also lit candles and centered an icon on the table. Since my altar was covered with cloth, I used pins to attach cards and notes and papers with quotes and drawings and poems to the fabric–words I could read to be reminded of all the love I was receiving from so many different directions. So finally, a few weeks ago, the night before I left for my trip and when I was so restless I knew I wasn’t going to get much sleep anyway, I set up my new altar. It’s base is a little rolling TV stand that I found for $1 at my local thrift store. It’s great, because my meditation cushion fits perfectly underneath it, and there is a little shelf inside on which to store my various prayers books. I’m using the same cloth I did last summer–it’s a white keffiyeh scarf that Arab men wear wrapped around their heads to keep cool in the desert. (Hmm, I’m sure there’s some kind of metaphor there for me–like the linen is shielding and protecting me and helping keep my wits about me in this desert-of-a-spiritual-season.) Noticeably absent is the icon–I do need a new one, since my previous one belonged to my previous husband. But I still have some candles, pictures of loved ones, and other mementos that inspire me each day. I purchased a bell to ring in and out of my sits (another product of religious envy that I experienced with my buddhist friends–I love the way they utilize the bell to move throughout their meditation, and to initiate a pause in the group’s process at any time). Recently I made a new addition, which is the little pillow you see on the right of the altar. I made it last week at a staff grief group as part of an art therapy exercise. 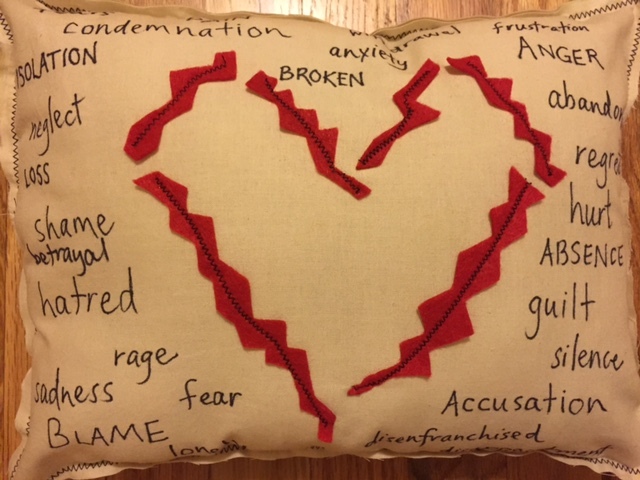 Our facilitator encouraged us to use one side of the pillow to express the negative aspects of grief, while the other side would express the positives that can come with/from grief. I’m really glad about how my pillow turned out. It shows the brokenness that I felt as I finally began to embrace the many and varied layers of grief in my life. But it also reminds me that though I am wounded and scarred, I am still a whole person, despite what some/one would say. Lastly, the chalice that sits at the center of my altar has become very significant to me. It’s filled with notes written by my chaplain colleagues while we were on retreat earlier this spring. 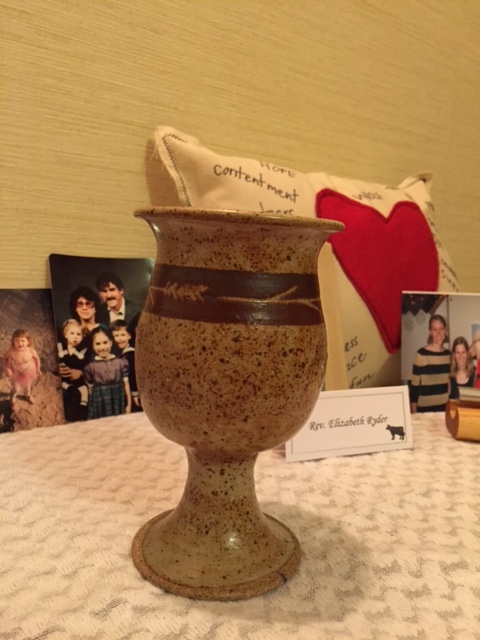 The theme for our day away focused on “the cup,” and each one of us got to select a cup that had been contributed by another chaplain and placed on a large altar we constructed in that space. That day we talked all about varying “cups” in our lives–cups we hold, cups we fill, cups we bear, empty cups… I reflected on the cup as it reminds me of communion–communion not just as the Lord’s Supper but as the Body of Christ–the community in which I live and move and have my being. The community that rose up to greet me last summer when I needed them most. Without remaining in communion with all those many people, I would not have emerged from that time with the strength I would need to carry me through this past year. One person’s note called my attention to the base of the chalice–which has a large crack where it was once broken and has been glued back together. I didn’t even notice it until it was pointed out. I realize that that is all of us–that that is me: an open vessel that was once broken at my base, but which now only lightly bears the scars of those cracks. A vessel that is still capable both of being filled and of pouring out, growing and healing and becoming whole again. My cup overflows. Thanks be to God.